Titan cartridge dust collectors are the most affordable high performance dust collectors on the market today. Designed exclusively for abrasive blasting applications, they provide the proper ventilation needed to assure maximum visibility, allowing the operator to work safely and productively. 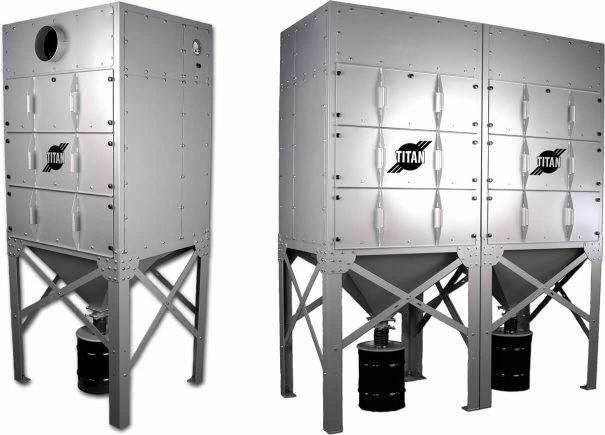 Titan dust collectors work with either standalone blast cabinets or blast rooms. The unique modular design is easily expandable or reconfigured to meet specific needs. Internal Abrasive Wear Inlet Baffles bolt in and can be easily replaced. Down-time is also a thing of the past as the reverse pulse cleaning system momentarily reverses the flow of air through the filter element, knocking caked-on dust into the hopper or dust drum while the dust collector is in operation. These dust collectors deliver maximum efficiency, require zero outside venting of air, and eliminate heated and cooled air loss – significantly reducing energy costs. Photohelic Gauge – Measures and controls differential pressure, providing fully automated cleaning and longer filter life; factory installed – Let us know when you order!